The City College alcoves, located in the lunchroom, provided the setting for much political debate between students during the 1930s and served as the base for various student groups. They also used the space for leisure activities such as playing ping-pong. In "Memoirs of a Trotskyist," a New York Times article from 1977, Irving Kristol (class of 1940) reflected: "The first alcove on the right, as you entered the lunchroom, was Alcove No. 1, and this soon became most of what City College meant to me. It was there one ate lunch, played Ping‐Pong (sometimes with a net, sometimes without), passed the time of day between and after classes, argued incessantly and generally devoted oneself to solving the ultimate problems of the human race." 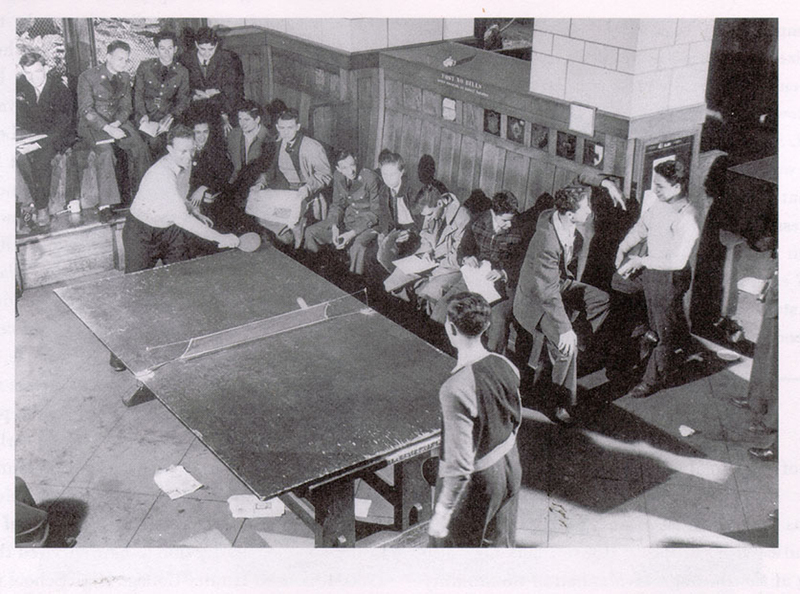 Cite This document | Unknown, “Students Playing Ping Pong in CCNY Alcoves,” CUNY Digital History Archive, accessed April 22, 2019, http://cdha.cuny.edu/items/show/3872.